Cancer is a tough disease to prevent. It exists in many forms and there is no vaccine. My aunt has fought cancer for 10 years and is now no longer treatable. She smoked for years, which we all know increases your chances of getting cancer quite a bit. But aside from quitting smoking, how can we prevent cancer? One of the biggest answers is in our supermarket or farmer's market RIGHT NOW! Strawberries have been shown to stop the growth of cancer cells. It seems that compounds found in strawberries actually inhibit the growth of a blood supply to a tumor. Isn't that amazing? Every day, your body creates tumor producing cells and every day your immune system recognizes them and removes them. The compounds in strawberries, no doubt, support you in being "cancer free". Of course, you have to be careful of the pesticides that they spray on strawberries because they can CAUSE cancer (isn't that annoying?). But you can find organic strawberries, and ones from farmers that have little pesticide load. At just 46 calories for a cup of strawberries they are both sweet and delicious. In that cup, you get 141% of your daily allowance of Vitamin C.
This is strawberry season and the cheapest way to keep strawberries in your diet during the winter is to buy a bunch now. Just put them on a tray in your freezer and, when frozen, dump them into a freezer bag. This way you get great strawberries all year round! the frozen strawberries sound good in a cool drink. afraid they would never make to the winter months with me, but it is a great idea. Actually there is a vaccine against HPV which is the cause of cervical cancer. And no study in humans has ever equated strawberry consumption with cancer risk. I like strawberries as much as the next gal, but let's not overstate things. One more reason to love strawberries. I am eating some right now! "Black raspberry and strawberry extracts showed the most significant pro-apoptotic effects against this cell line"
Thanks for reminding me that I have strawberries in the fridge! Karen - strawberry extract isn't strawberry and lots of things can be done with human cell lines that don't translate in real actual human people. 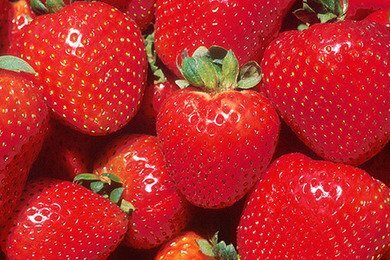 You know, I realize that a cell line is different than a human tumor - but the research that is coming out on strawberries' effect on blood vessels to tumor growth is really compelling. Start watching this guy's talk at around minute 11. Also, there is Avastin - which is an FDA approved drug that stops the growth of blood vessels to tumors. The compounds in strawberries are similar to Avastin. I'm pretty convinced that strawberries are an anti-cancer food. Strawberries are also in the top 20 list for best food sources of antioxidants. "Antioxidants are substances that may protect your cells against the effects of free radicals. Free radicals are molecules produced when your body breaks down food, or by environmental exposures like tobacco smoke and radiation. Free radicals can damage cells, and may play a role in heart disease, cancer and other diseases." from http://www.nlm.nih.gov/medlineplus/antioxidants.html. @robin - I'm pretty sure none of those people or you understands how to interpret adverse event data. thanks for reminding us all that the internet is full of junk information. The study of strawberries effect on cancer was at the Ohio State University Comprehensive Cancer Center – Arthur G. James Cancer Hospital and Richard J. Solove Research Institute (cancer.osu.edu) is one of only 40 Comprehensive Cancer Centers in the United States designated by the National Cancer Institute and was recently awarded the highest ranking possible – exceptional – by NCI. Ranked by U.S. News & World Report among the top cancer hospitals in the nation, The James is the 205-bed adult patient-care component of the cancer program at The Ohio State University. The OSUCCC – James is one of only seven centers in the country funded by the NCI to conduct both phase I and phase II clinical trials.